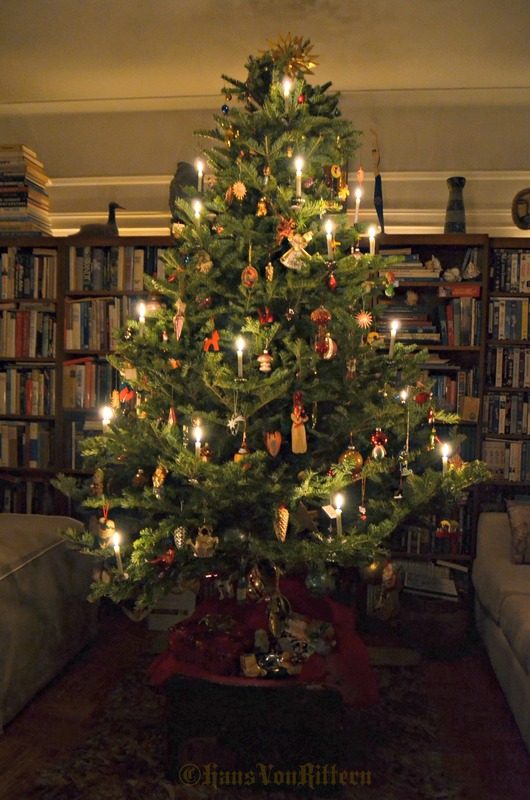 MY OLD FASHIONED GERMAN CHRISTMAS TREE 2013: Yes – those are real candles. We celebrate with no flashing lights or loud music, our ‘church’ is the tree. The tree is decorated with ornaments dating back several generations, about ninety years. Modern ones are included of course, that way the tree is a living story of the family’s history. The favorite ornaments are hung so that they will catch the candlelight and the whole tree tells a story of the family’s history. Mementos from trips abroad, favorite childhood ornaments, all that tell our likes, hobbies and loves. Tin foil wrapped chocolates and marzipan fill the tree as well. We usually get the biggest tree that will fit in the apartment (we once had a 14 foot tall tree) but now that mom is downsizing, we get a smaller tree and it is placed on a turn of the century old wooden steamer trunk that was used when my great aunt came to visit us in the New York and it is used as a table base to place the tree upon. Depending on the size of the tree, anywhere from two to four dozen candles are placed in strategic spots in the tree. Each candle illuminates the special ornaments nearby. 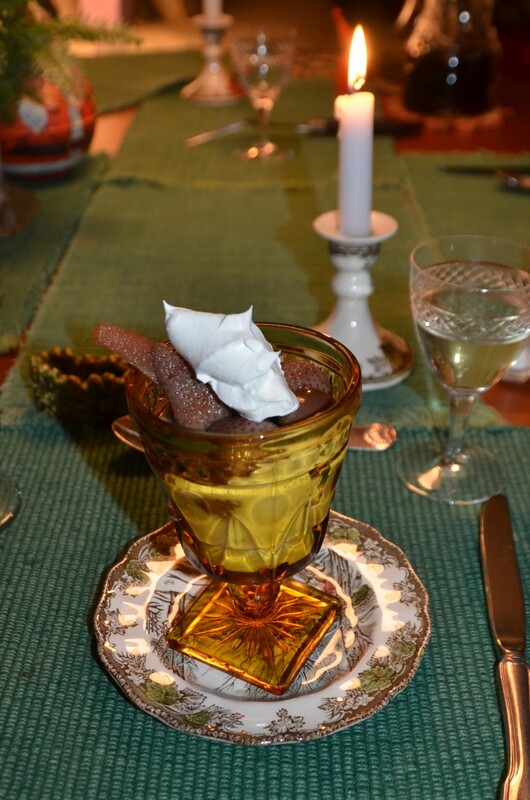 The candleholders are metal clip-ons in the shape of a pine cone. You can still buy the candles and holders at Schaller and Weber’s, a surviving German delicatessen just off 86th Street on Second Avenue in what was once an entire German neighborhood. 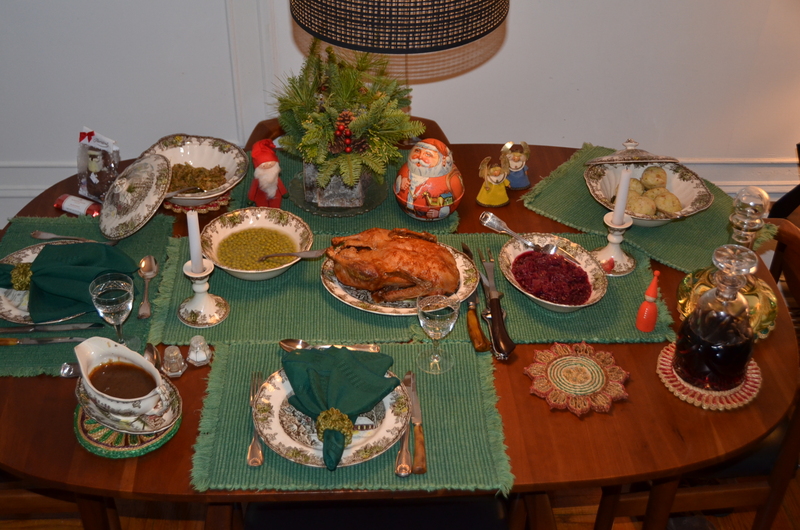 December 24 Christmas eve, we have our traditional Christmas goose dinner with roasted apples (this year we had duck), home made dumplings, white asparagus, red cabbage, string beans with topping and lots of gravy. After dinner, the elder of the family lights the candles in the room and on the Christmas tree and puts the ‘Christmas record’ on the phonograph. The record is of German church bells and church choirs singing. When all is ready, a golden bell is rung and the rest of the family comes into the glow of the room. We stand quietly side by side, arm in am or holding hands and quietly listen to the beautiful music we have listened to for decades before. That is ‘church’ to us. As the first side of the record ends, we play the other side, sit down and just quietly gaze into the serene candlelight, watching the ornaments glisten. No electric lights are on in the room, just the glow of candlelight, just as it is in Germany, France, and all of Scandinavia. Let your imagination go back to the late 1800′s enjoying a room just simply lit by candlelight. The second side of the record ends with a jolly children’s song “Der Weihnachtsman ist da!/Santa Claus is here!”, signifying it is time to open presents by the amber glow. We grab some of the marzipan, gingerbread and chocolates that are on the dining table for all to enjoy as we open our treasures. At midnight a bottle of champagne is opened to ring in Christmas day and we all have a helping of mom’s strong rum pot preserves! At one time it was my whole family enjoying this tradition, now it is just my mother and me left to carry on, and one day it will just be me, but I will always do it, perhaps with a heavy heart. But this is Christmas, a German Christmas, my heritage. My great grandmother’s, grandparent’s, mother’s and my heritage. Fröhliche Weihnachten!